The new Austrian Honorary Consulate in Chicago, the metropolis of the Midwest, is now operational. From the late 19th until the mid-20th century, Chicago was a main goal for Austrian immigrants into the US. Tens of thousands found themselves a new life there. 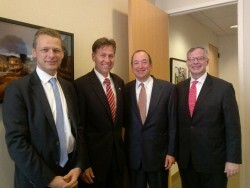 Today, the Midwest is an important region for Austrian business.